Posted in Consciousness, Future, Krishnamurti, Language. Thanks so much for introducing me to this wonderful man. I went to his site and found many great talks. However I could never find this specific one. Nor did I see your links or embeding of it. Which specific talk is this from? Thanks so much for the kind mention of my work and my exhibition in the introduction to the episode, Lorenzo. I really appreciate it, and all that you do in bringing us these inspiring talks by inspired minds. Keep up the great work – and thanks again. This one really cracks me. Wonderful performance. Welcome back and thank you Lorenzo! 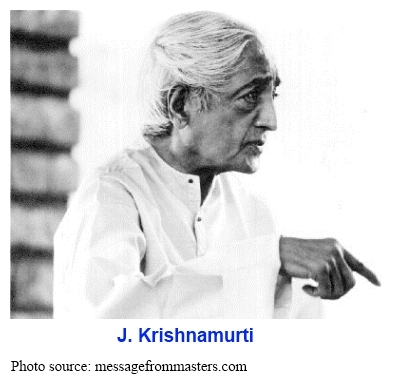 I never heard Krishnamurti speak before. What an inspiration and thanks for posting it. I am going to have to give this one a second listen. I posted a link to this episode on my blog, it deserves a wider renaissance. I first read JK when I was 20 over 30 years ago now and even though at that time I didn’t really understand what he was saying yet I felt the profundity of his words. He strips everything away leaving that which we all share. There are many who have followed in his footsteps but he was the pioneer. …and by good soil I obviously refer to the tribe. I appreciate another podcast so much! Thank you Lorenzo, my dear cyber friend and teacher:) I was well when you were away, and it makes me happy to think about you lazily reading and hanging around with your loved ones. Please don’t feel obligated to do the podcast, but know that there will always be good soil waiting for you to plant these divine seeds in it, whenever you like to. JK’s speaking style reminds me of a cross between Alan Watts, Aldous Huxley and Deepak Chopra. Thank God the Salon is back! 🙂 I was having some with drawl!!! Press on Lorenzo! The day after I discover JK he’s on your podcast. You’re such a synchronicity generator, Lorenzo.